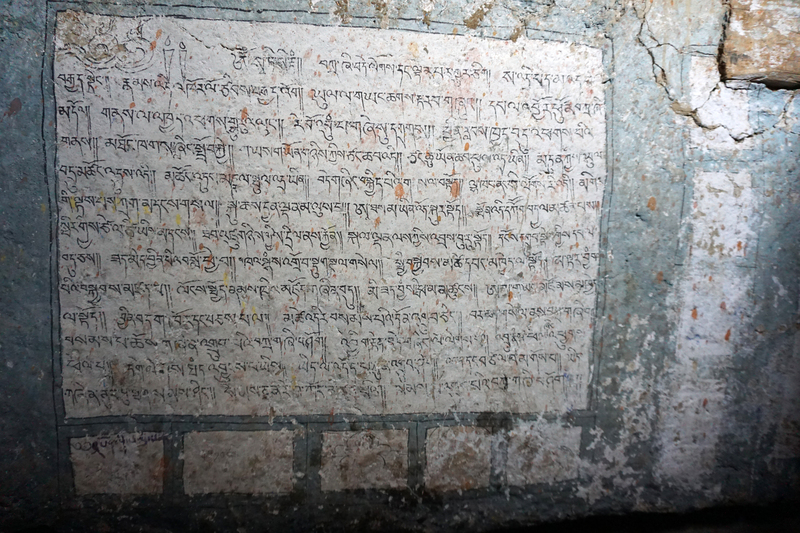 Coordinates of the site: 29° 7’56.70” northern latitude and 83°11’18.84” eastern longitude, at an altitude of 4069 meters. 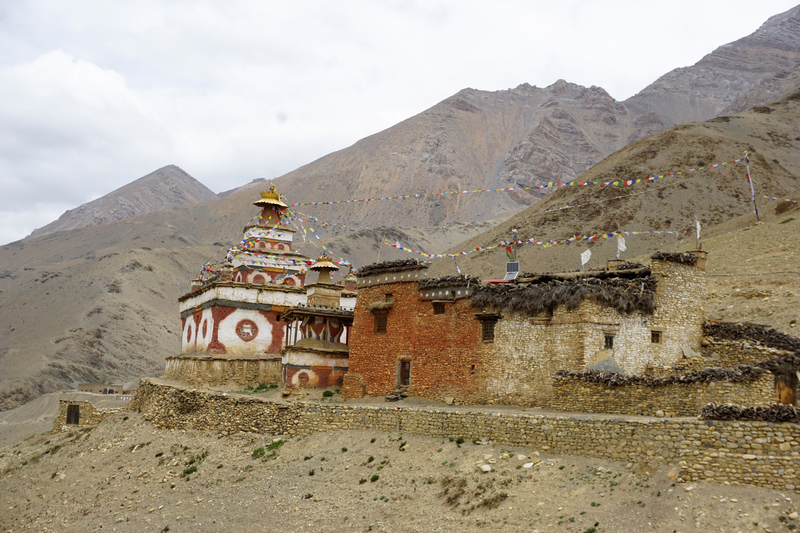 The settlement of Dho is located in the Tarap Valley in Lower Dolpo, slightly elevated above the confluence of the rivers where the eastern tributary meets the Tarap Valley. 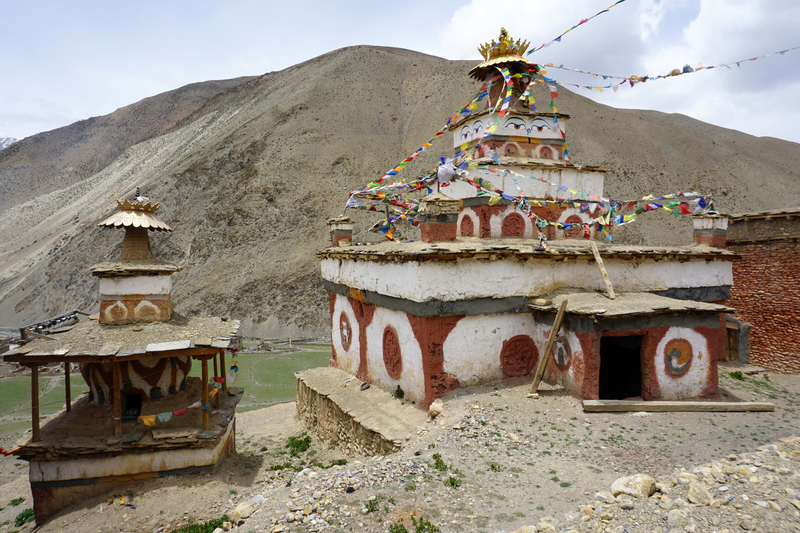 The Ribo Bhumpa Gompa is located north of the village on the rising mountainside, from where one has a sweeping view of the southwest running, fertile Tarap Valley. 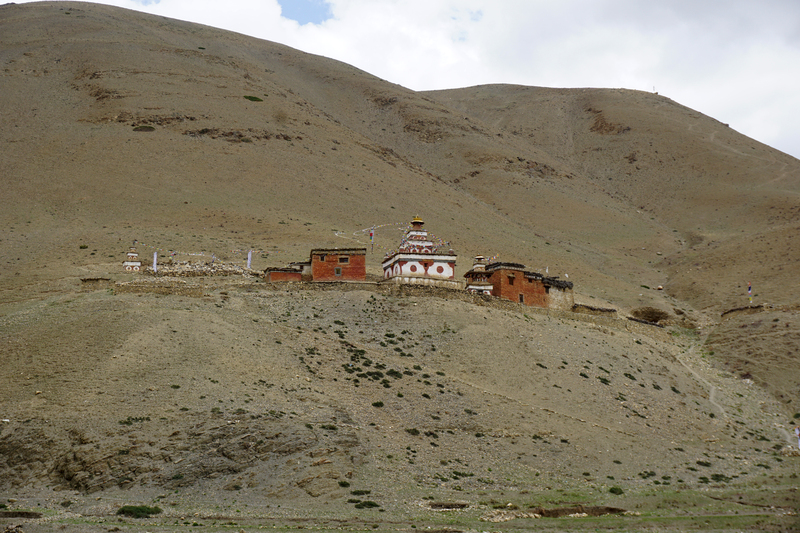 The ensemble consists of several individual buildings which are lined up next to each other along the slope. 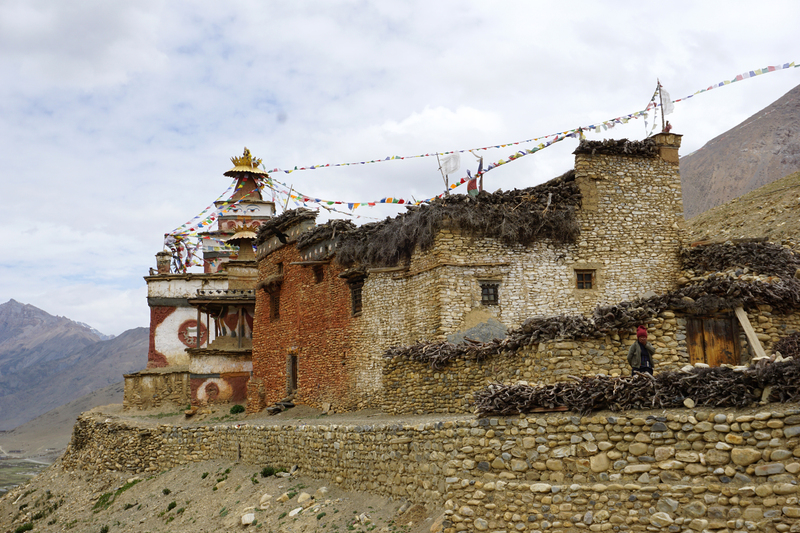 The gompa with an external dimension of 11.2 x 7.3 meters is located on the northwest side. 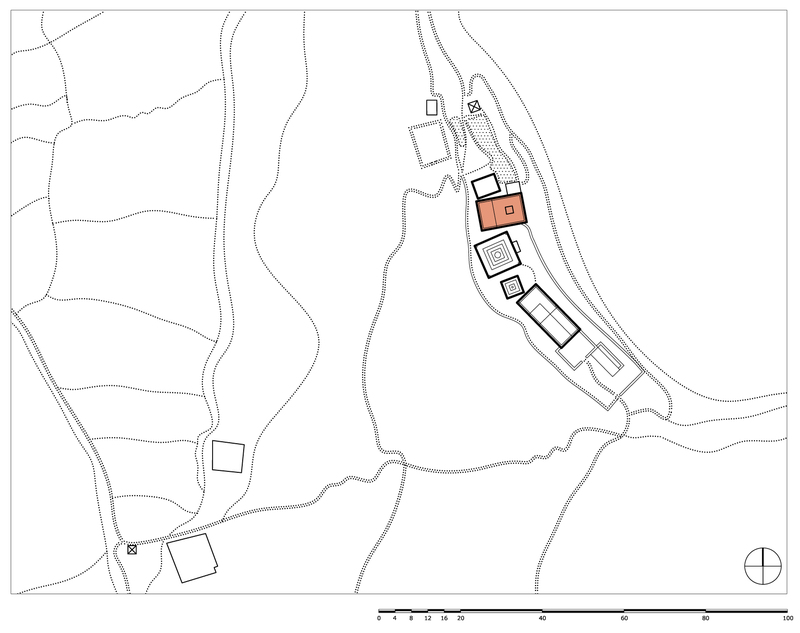 Closely next to it stands a typologically extraordinary chörten (8.5 x 8.5 meters) with an access on the west side leading into the interior of a chapel. 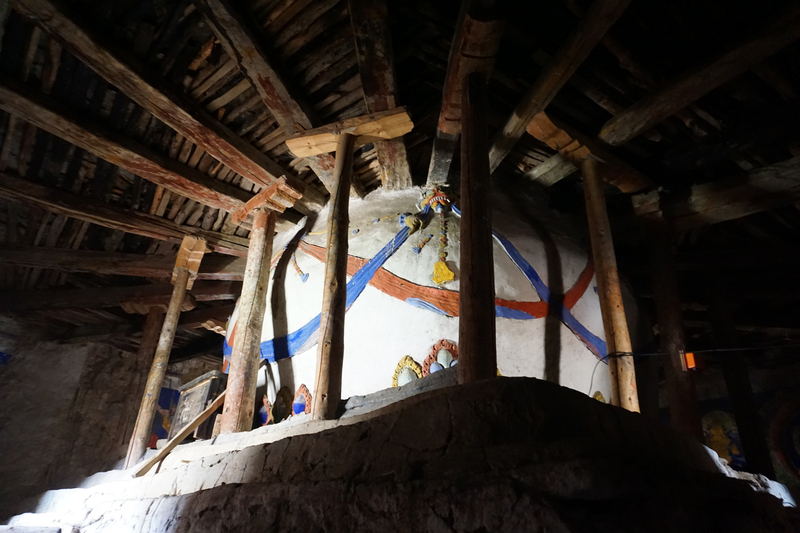 It consists of an ambulatory with painted walls around a smaller chörten. 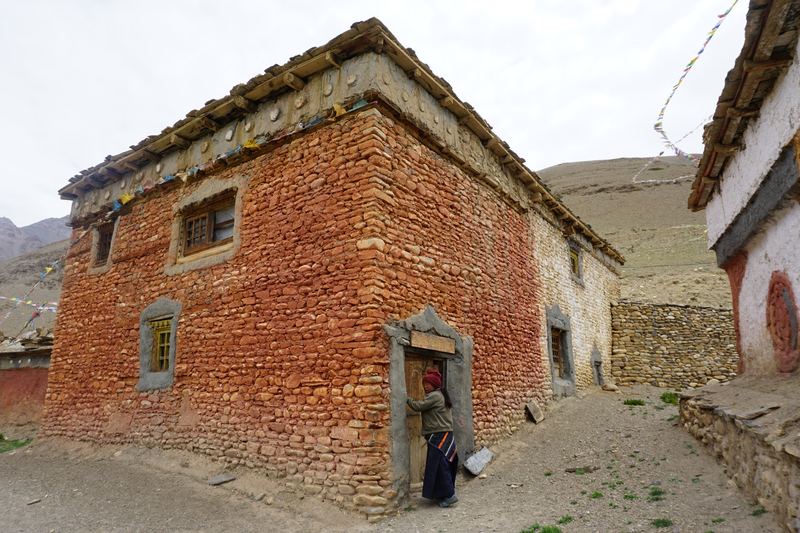 A long residential house of the lama, where two further chapel rooms are located on the upper floor, completes the ensemble with a walled courtyard and an open porch on the southeast side. Towards the valley to the southwest and along the mountain side in the northwest, natural stone walls fortify the graded terrain and allow a circumambulation of the area. 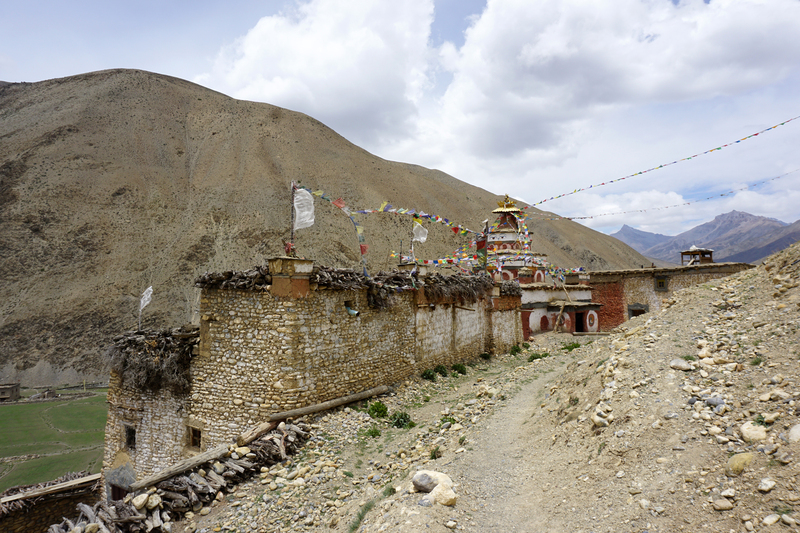 On the north side of the temple there are two single-storey outbuildings, above it a Mani wall and another chörten. The entrance to the temple is located on the southwest corner of the building, opposite the chörten-chapel. 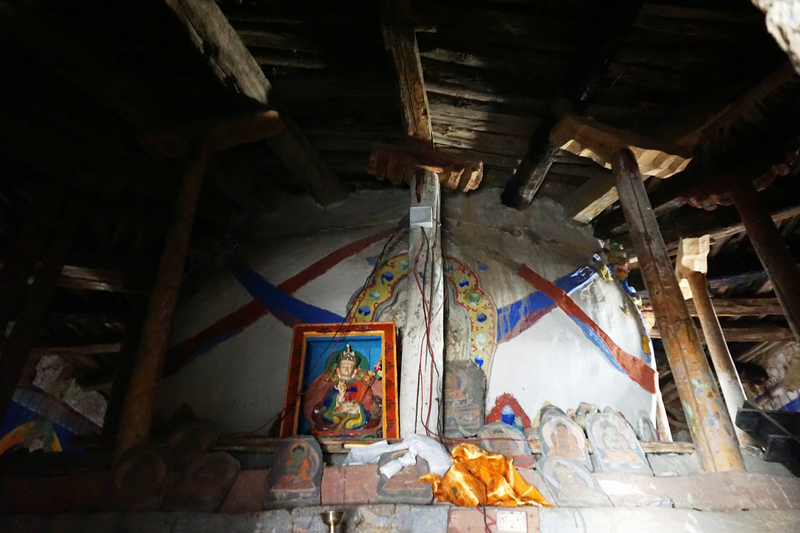 A narrow vestibule leads to the entrance door of the temple on the ground floor and by means of a ladder to the floor above. 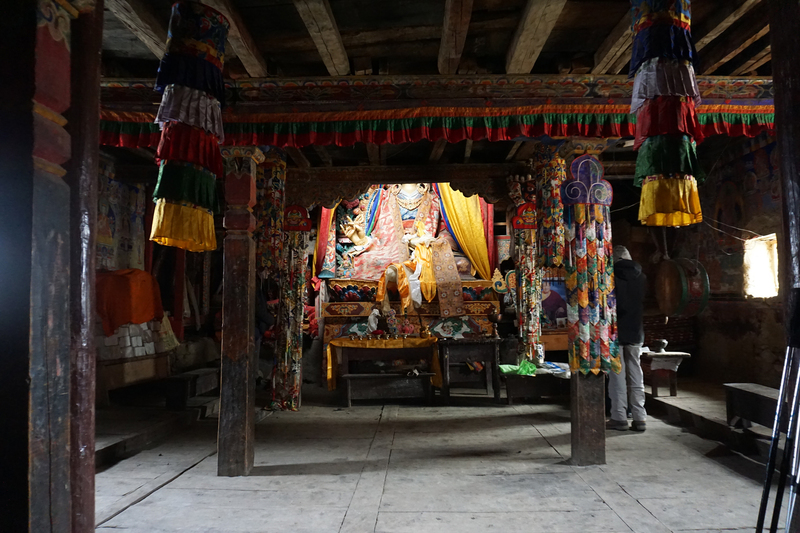 The interior of the temple is decorated with murals and structured by six wooden columns. 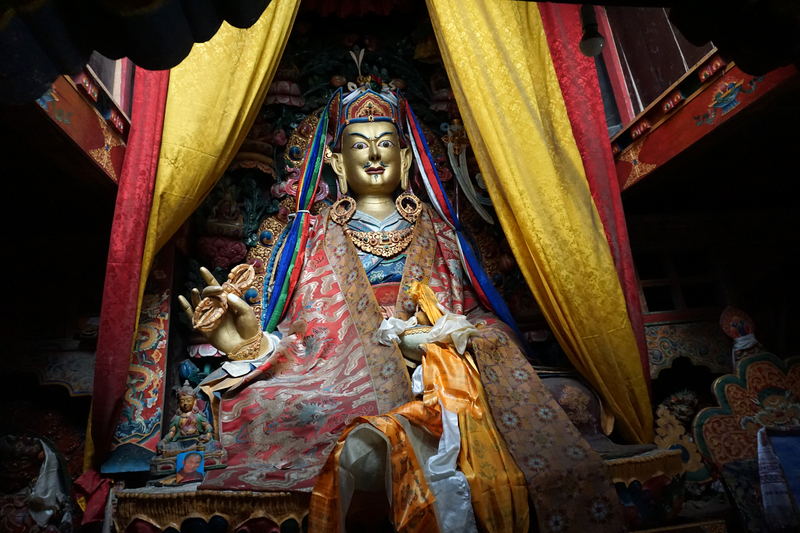 In the altar area of the room, on the west side opposite the entrance door, stands a large figure of Guru Rinpoche. It towers up to the second floor and is illuminated by the overhead windows. 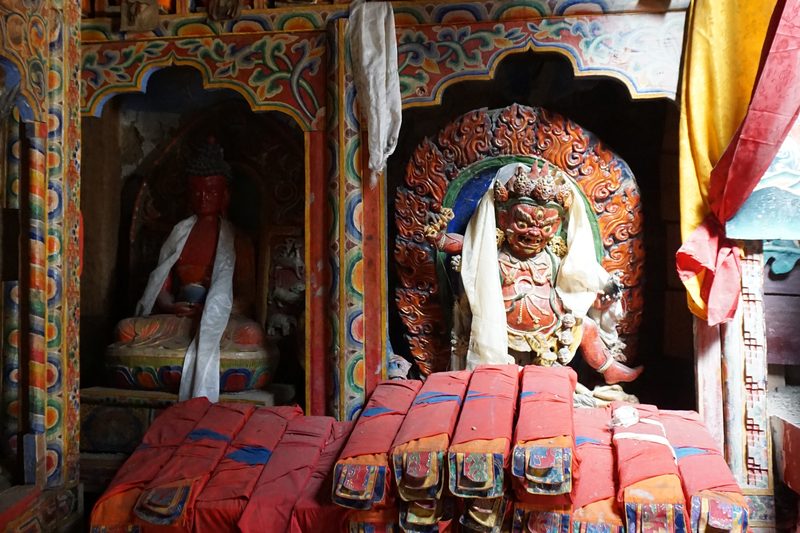 The room-high painted shelves next to the altar area contain various sculptures and Tibetan books. Further windows on the ground floor are located on the south and north side of the room.